Good subject and good work, I was struggling with it in the past there are many mistakes even in front axle and everywhere some missing in driveline and brakes. I guess my built can help you. Dario - that is going to be an invaluable reference! I am going to be looking at your photos A LOT! Missed the bit about the steering connector rod being BEHIND the #1 axle. I did think it was strange for a heavy vehicle to have it out there in front of the first axle where it could get bent and knocked around. Thanks for the info, Mike. Looking fantastic! Missed the bit about the steering connector rod being BEHIND the #1 axle. I did think it was strange for a heavy vehicle to have it out there in front of the axle where it could get bent and knocked around. Dario, I would love to see ANY additional photos especially any under body photos that show the brake actuators and/or the torque control rods attached to the differentials! I am about to the point where I am thinking maybe I should follow Gino's train of thought and just buy the new Trumpeter HEMTT and add the Italeri LHS parts to it! For now I am keeping the faith and continuing on with this project but I am beginning to question this course. p.s. As to detail photos of the HEMTT I am finding that it was easier to find detailed reference photos of the Russian MAZ 8x8 trucks I built a few years back than it is to find decent info on the HEMTT. Even the HEMTT TM manuals show very few (read none) overall images and everything is in the form of line drawings which are so close up to the part in question it is difficult to orient yourself to what you are actually looking at without the real vehicle in front of you for reference. Hate to say it but I think the Russians do a much better job on their maintenance manuals! At least for our purposes. Still trying to come up with a solution for the outboard differentials. I fear anything I do will end up looking like a botch job. This is as far as I have gotten. Whatever I produce at least it will look smaller than the other diffs, WITHOUT the gear reduction head and the drive shaft entry bearing will be more centered than it was. Not some of my best work but I am going with it! A pyramid of rough cut plastic circles. Plus a lot of sanding, some body putty and a lot of primer. A pyramid of rough cut plastic circles. Plus a lot of sanding, some body putty and a lot of primmer. Looks good. I had been thinking about your post. 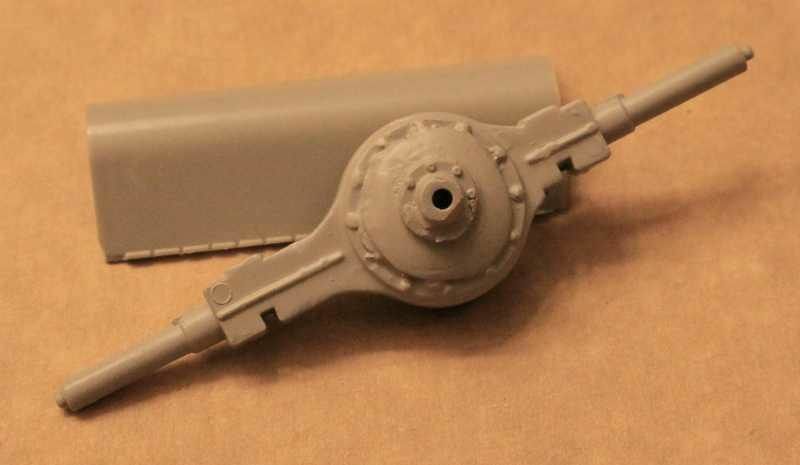 I was going to suggest possibly cutting the domes off the axle housings from an m35 or m923 kit to use as the third member housing on your axle housings. Hot Dawg! Three axles on the ground! Can anyone direct me to a site that would give me some idea what radio would be proper for this rig? Again I am a newbie to anything past 1945. A single SINCGAR or ASSIP set up would work perfect. Check out the pic I took for Primeportal on the radio setup. Check out these Trumpeter instructions on where to mount the antenna and radio. Removed by original poster on 08/10/16 - 09:41:13 (GMT). I just wanted to recommend a thorough clean up of any mold lines or burrs in the area of the main hinges. I you don't succeed in getting this hinge to move freely you will end up breaking off either the hinge pins of the hinge tabs on that big main strut. 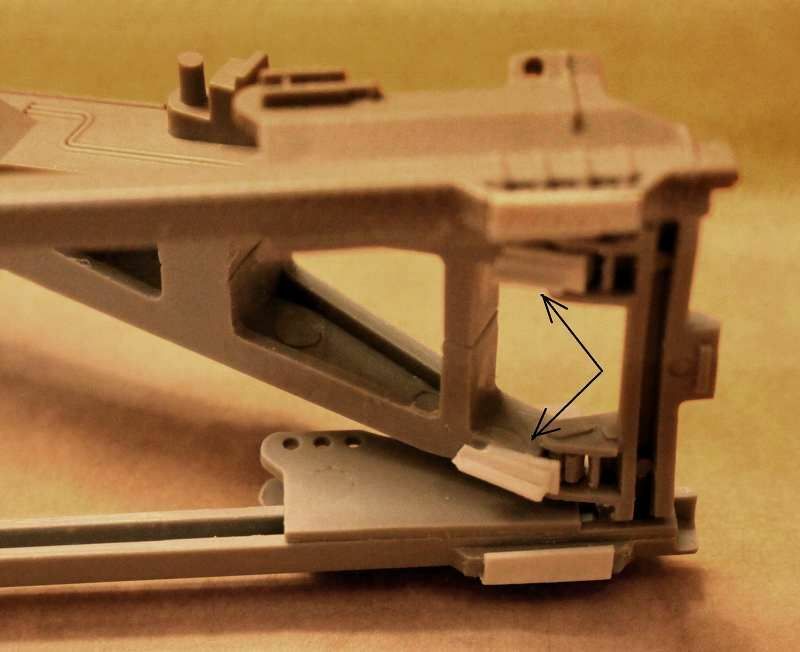 Problem: Italeri intends that this be a snap together hinge but once a proper clean up in done chances are the hinge will loose this "snap on" quality. Also my thanks go out to Epi for his info on the SINCGARS radios. It is going to take me awhile to digest that. WWII tank radios were bad enough - WOW! I think Mikeybugs is working on doing those radios right now. Looks like I will be placing another order with Shapeways or Click2Detail! One of my favorite photos of modern US equipment. The last axle is also powered. (I think that is a bit of over kill.) The axle uses radius rod suspension linked to air bag springs. Your detailing of the M1120 LHS is looking good. It will be really nice when done. Are you also planning on putting a container on the back. If so, the Trumpeter one looks better than Italeri's offering at about the same price. Yup, an M1074 PLS, which is exactly what I plan on kitbashing together from the Italeri M1120 LHS parts; Trumpeter M983 for the cab, chassis, and main running gear; the additional axle and suspension parts from Accurate Armor's M1070 HETS, and wheels/tires from the Hobby Boss M1070 HETS. The center axle is actually the one with the radius rods and air bags. As you can see below, the last two axles are the standard HEMMT style, with the middle one w/the air bags. On an M1070 HETS, but the setup is the same. Michael.. you're doing a nice job on this kit.. it'll be a good reference if I decide to do one. 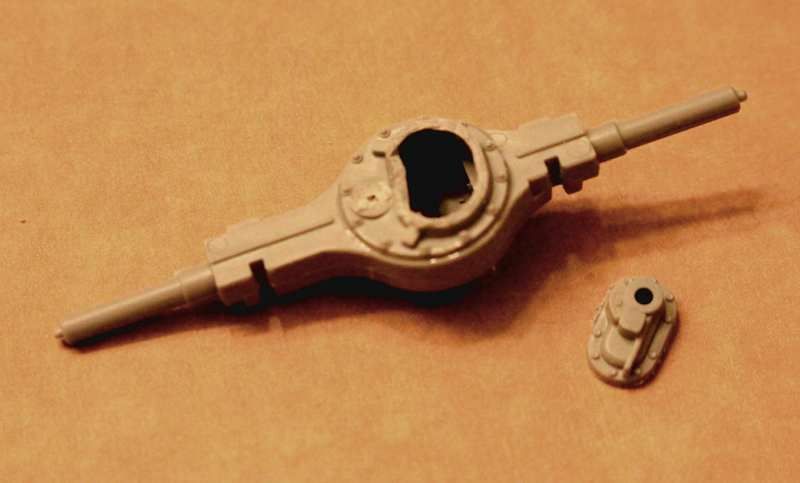 Gino - That's what I get for taking (or giving) reference to/from a fellow modeler on the Internet. 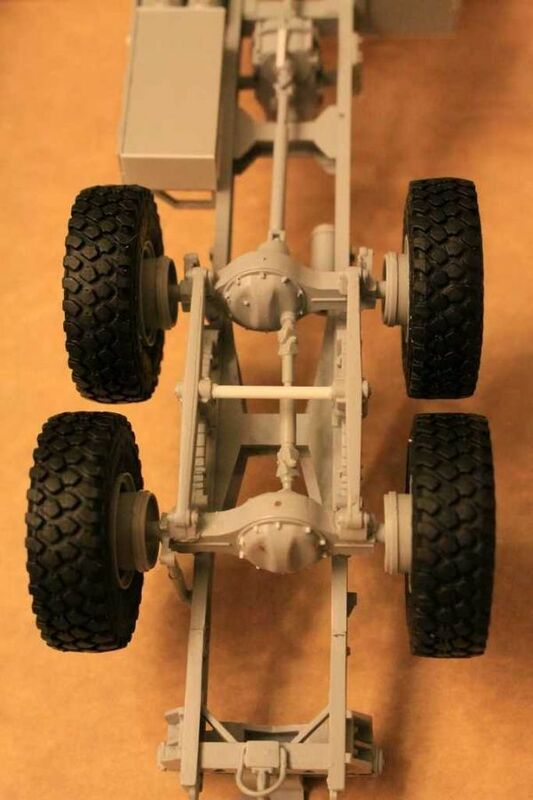 I am sure in the photos of his model he was adding the extra axle in the rear position. I know his extra axle was definitely powered but perhaps I misunderstood it's location. Is that center (extra) axle on the PLS also driven? In my design world it wouldn't be. 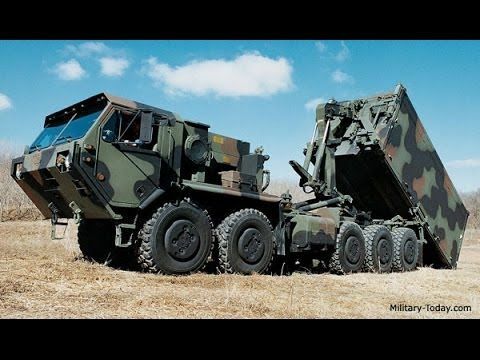 Hey when you already have an 11 ton capacity 8x8 and need more load capability you probably don't need the extra traction of a 10x10. But this is the US Government we are talking about; so why have just one when you can have two at twice the price. Hisham, coming from you that is high praise. Thank You Sir! With Trumpeter and Italeri putting out new/newer HEMTTs, I wouldn't be surprised if we see an actual kit of the M1074 PLS. At least that's what I'm hoping for. Dustin, given the commonality of so many of the vehicle parts and the market's current willingness to produce almost everything under the sun I feel it is just a matter of time until we get a PLS. 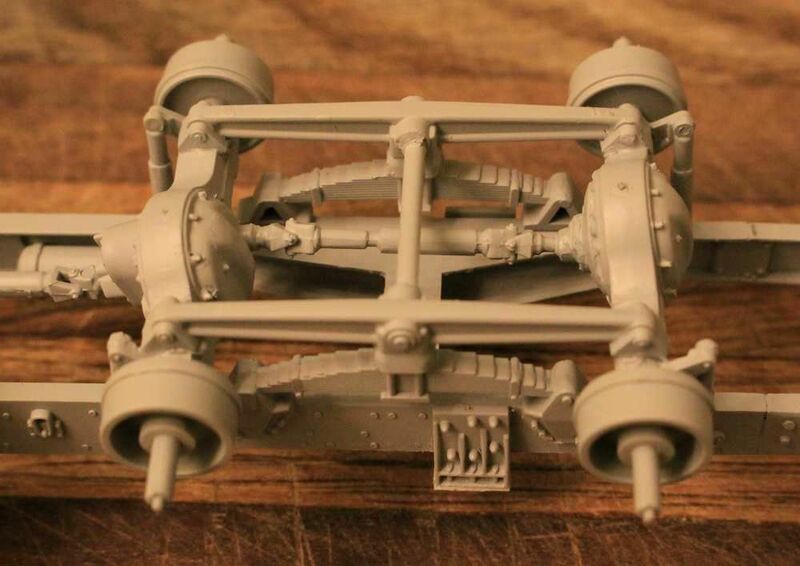 We can thank the current state of the CAD design industry and the ease of digitally printing masters and proof/check copies of the model designs for the bounty of models we are seeing coming to the market.